Welcome! This is the log where I'll post anything which I've converted and/or painted for others. Most of my hobby work is not done for my own armies, but rather for my brother's and our friends' collections. It's a great way to experience modelling and painting all miniatures in Warhammer without buying them. Background might be added later on as my friends work that out. Sorry for the glossy-gloss varnish. Most paintjobs are old, some models are damaged and awaiting repairs. Matt varnish will eventually catch up with everyone. Let's begin with the miniscule finished Lustrian collection. Consisting of one Saurus Drummer and an Elven courier who've been through hardships without end in the jungle. The Saurus has on his base the first or second whole model I ever sculpted, namely a Pygmy Halfling who angered the reptile. Spawning of Tepok and Sotek. Whilst the Elf have a baby Ancylosaurus. Here's a sculpted version of my brother's cat. Christmas present. Beside the old, ragged Elf sculpt. The cat was on one tournament the army general of a friends quarter-painted Skaven army. Here she is with some giants rat. Plus a test Skaven/Kobold converted from a BFSP Night Goblin. Speaking of vermin, next are some Gobbos I painted for two friends. Note the small Squigs, the entrails, the mummy and the fish shield. My brother's excentric Undead army have headless Dire Wolves. The primary reason is dislike with the big heads in the plastic kit. Background-wise it's logical for Dire Wolves to go headless sometimes, since Old World peasants behead any wolf corpse they find as an obstacle for Undeath. Note Halfling head and rat on base. A friend of ours also have some Undead. Here are a few Mantic Skeletons which I painted in Empire colours, including shield symbols. Can you spot their origin? The middle swordsguy is painted by the friend. Said mate also have Warriors of Chaos. Here's Fetth the Flyface, bringer of many laughs and built from plastic sprue, filler, super glue and green stuff. This thing may now be an Eye of the Gods marker, but since that didn't exist when I built it for another friend, he thought I was an idiot for making that out of soft airgun pellets. He was funny to listen to when he condemned the pathetic nature of the eye pile! And his Elves. 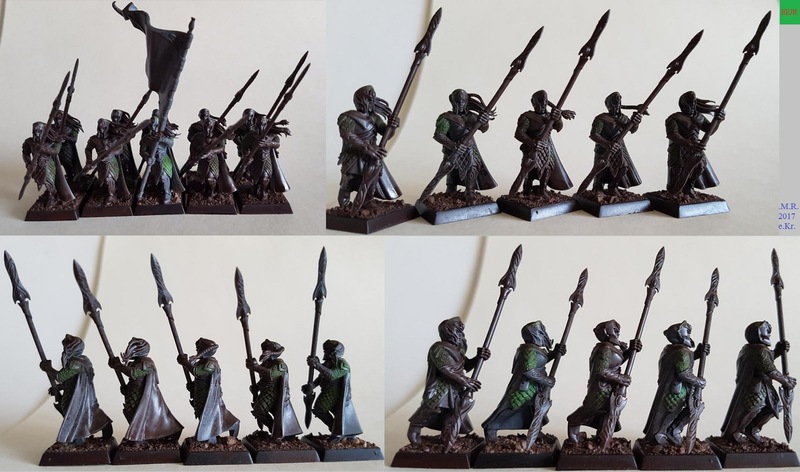 We developed their colour scheme when painting Lotr High Elves years back. We're slow painters (though we're picking up speed and method now) and have no finished unit to speak of. Elves are fairy fey for starters, so to make them convincing, grounded and lethal they needed a pretty dark and realistic colour scheme. No pinks here! Note cloaks on the Swordmasters. And lastly we have one of five WIP Raven Heralds. Note saddle bags. Comments and critiscism as welcome as ever! This post was last modified: 09-11-2017 04:35 AM by Admiral. Edit: number 4 is Ostermark. This post was last modified: 05-14-2014 06:26 AM by Dînadan. The pile of eyeballs are wicked! Also love that pirate. @Dînadan: Thanks! You're very close to full score. From left to right they're Bogenhafen (some wine-growing fat town), Middenland, Hochland, Ostland and Stirland. Ostland seems to have both black-white and yellow-purple uniforms. @Vantraxx the Thrice Cursed & Abecedar: Thank you! Some weeks ago I played two quick 1000 pts games against a visiting friend and my brother with mainly unpainted stuff. In my first game the Hellcannon without crew was the sole survivor and victor on the battlefield. In the second game it was my brother's Elf Mage, who blasted the only remaining enemy (my Hellcannon, again) to smithereens in the last turn. As usual, my cat wished to partake in the battle. She toppled some Elves through mere clumsiness. Most of the featherwork have been made on my brother's Raven Heralds. Some more of that, and then there'll be bowstrings and needle arrows. Chuck in heads and some extra package and they're off to his paintstation. This post was last modified: 09-11-2017 04:36 AM by Admiral. This post was last modified: 05-19-2014 10:50 AM by MadHatter. @Yodrin: Haha, indeed! But the Destroyer is already overpowered as it is with that point cost. @MadHatter: That's an idea worthy of a mad hat. But ridiculously overpowered! They'd have 9 wounds each, for a start. A lot of hobby work has been carried out alongside my brother on Night Goblins and Elves. However, I didn't bring the camera to his place, so no picture proof of it. But there's more proof of Cat'Daai destroyer on the rampage! She intervened in the battle during turn 2, avoided my counts-as CDs (BFSP Night Goblins) and scythed through the High Elves. Cat enters the battlefield. She loves Warhammer, both the tabletop game and the workshop part. The dice is tossed. What will the D6 show? It must have been a stupidity check. The tower is under attack! It's rampaging through the Swordmasters! The Elves were saved when the Cat'Daai Destroyer fled from the battlefield. It still ended in a High Elf victory. This post was last modified: 03-22-2018 06:16 AM by Admiral. This is hands down the BEST battle report I have ever seen...I'm laughed so hard I cried. ... also some nice models. This post was last modified: 06-10-2014 03:05 PM by Bloodbeard. @Fuggit Khan: Haha, you're welcome! @Bloodbeard: Thanks! The fearsome K'miaw, hungry for glory on the battlefield and food in the kitchen. Our cats often accompany us when we do Warhammer stuff. My brother's cat usually interrupts him mid-work by occupying his lap, and my cat is so nosey and friendly when I work on something that she delayed work on the Chaos Dwarf headtakers by perhaps a whole day in total when I converted them in a long sweep two years ago. Rest assured, the fearsome Cat'daai Destroyer has grazed many a tabletop battle since last update, but we lack picture proof of it. Got to take some new ones. Our cats were odd for kittens to begin with, but they're getting even more eccentric and cute in their own ways with age. This update is however not about something as lethal as cats. 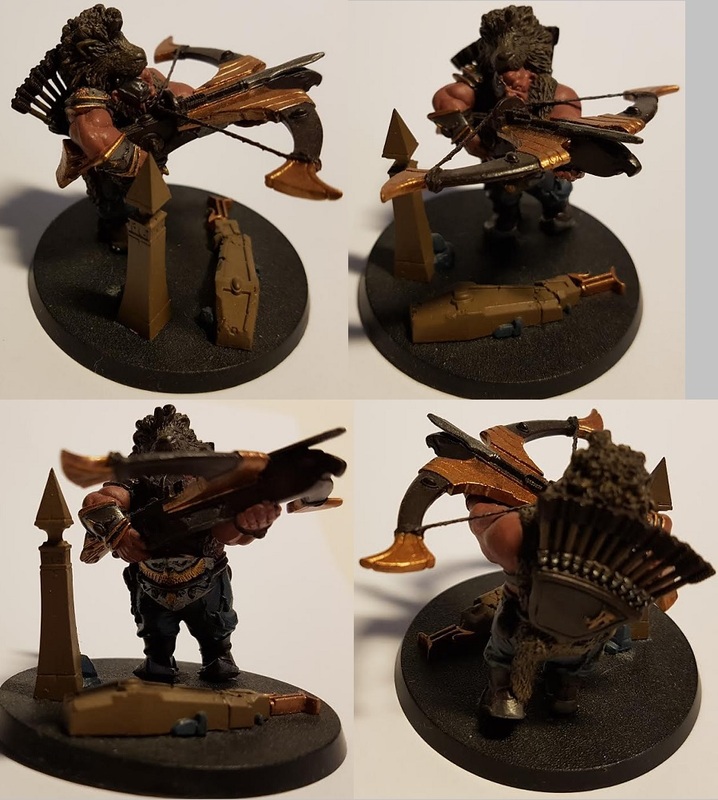 It's about something pathetic in comparison, namely a Maulerfiend conversion I've been working on-and-off with for a Skaven-collecting friend of mine. It's based on a sketch he drew. My buddy magnetized a rectangular base so that it could be used as a K'daai Destroyer. @Dînadan: Thanks! We'll see how long. Evil dwarf Ogre slave/mercenary with big hat is planned, as is a much updated asscannon. Big projects, though, so not likely to happen very soon. Thanks Abecedar. My cat Busan always excelled at fun and play, unwittingly or not. This post was last modified: 03-17-2017 06:38 PM by Admiral. 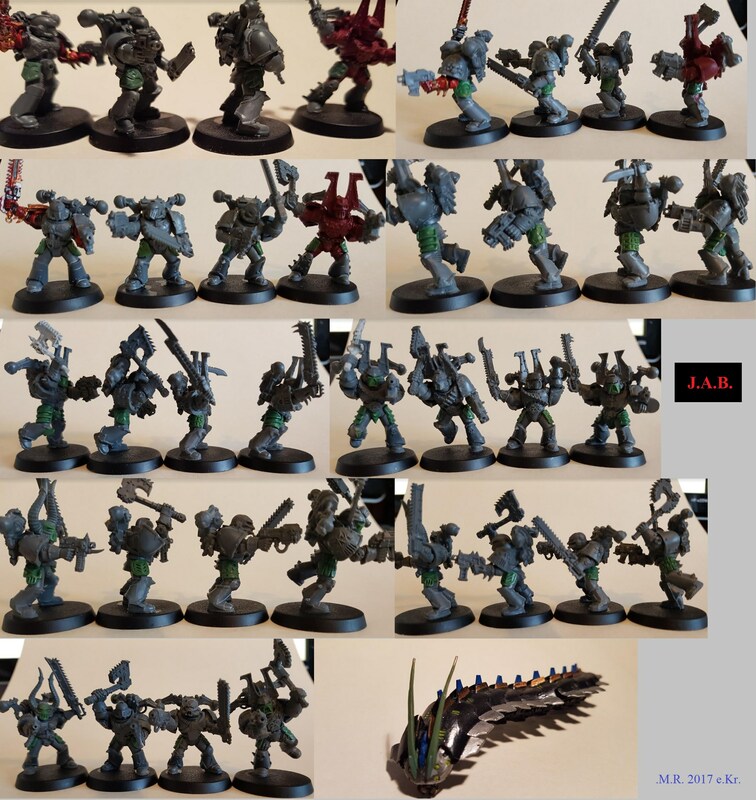 The CSM-collecting friend, let's call him J.A.B, inspected the newer starter kit Chaos Space Marine lord and Khârn, as well as the new Primaris Marines and probably a few older Space Marine character sculpts. He concluded that hip armour looks good and solves the silly look achieved by the thin thighs of plastic Space Marine legs. Some weeks ago, he visited his parents, brought a gaggle of heretical Marines and asked me to make hip armour on them. Quicksculpted, without time-consuming rivets, difficult spikes or suchlike. He was content, and after returning home to his study town he sent down Berzerkers to receive like treatment, and a FW Necron centipede which needed replacement antennae. I've tinkered with them since they arrived yesterday. Below are the results. Note "KIL KIL KIL" on the knife Berzerker's segmented plates. Also see his painted Lord of Change. That's some very nice elves! Cool regiment. I like what you did with the space marines. A nice job you did for the guy. How many hours of work in that? Thanks! Not more than 10 hours in total, perhaps less than 8, or about 6. Didn't keep count. The first pioneer batch I did for him was quite quick, but for this, the second batch, I just had to repeat the same moves and armour patterns with the sculpting tool. Quick stuff, when the one you are sculpting for is content with a little shoddy work (as in; not up to par for standard for casting). This post was last modified: 08-02-2017 03:12 PM by Admiral.